It’s out into the garden we go on a warm summers day to explore the blades of grass and bark on the tree trunks in the hope of discovering the army of ants that it is home to as they always lead you on a trail of huge wins! You’ll be joining Adam the ant, who is the leader of the colony, along with his Workers, Soldiers, the Colonel and the Queen as they attempt to evade the clutches of the vicious Aardvark who is also roaming the garden armed with a net to capture them, plus there are other creatures to meet and greet along the way. Consisting of 5 reels with 3 rows and 20 paylines (the number of paylines increases to 40 in the Colonel and Queen free spins modes and Aardvark Antics feature) you’re in for a wild time in this garden as you’ll be getting to grips with different types of Wild symbols, including Roaming Wilds, in the hope of landing wins that are much bigger than the size of the ants you find! You’ll be meeting many different ants from the colony which Adam is the leader of as well as various other creatures who live in the leafy suburbs on these reels with Adam relaxing on a sunflower leading the way as the most valuable as he can deliver wins of up to 500 credits and can substitute for all other symbols aside from the Bonus characters. The Bonus characters you’ll be meeting are an Aardvark armed with a net trying to catch the ants, a Worker ant, Solider ant, the Queen ant, and the Colonel ant. 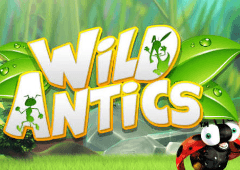 In addition to these the Wild Antics logo will appear Super Stacked, you’ll get to meet a snail, ladybird and a caterpillar, plus Ace to 10 icons feature amongst the grass as the lowest valued symbols of all. Your heart might sink a little bit whenever the horrible Aardvark appears on the first and third reels along with one of the other character Bonus symbols (Worker, Soldier, Colonel or Queen) as he swings his net and captures the ant, but your sadness will be short-lived as you trigger one of the following four free spins modes with Roaming Wilds featuring in each. Worker Ants: This free spins mode sees Roaming Wilds appear on the fifth reel and every spin after that they will roam around to boost your chances of winning. Soldier Ants: Here you will enjoy all the perks of Worker Ants with the benefit of any Roaming Wilds that land on the same position creating multiplier bonuses of 2x up to 5x. Colonel Ants: This free spins mode sees 40 paylines become active as you enjoy Expanding Roaming Wilds as the Colonel goes walkies across the reels and whenever two appear in the same position they will expand to cover the whole reel. Queen Ant: Again, there will be 40 paylines active here with the Queen appearing as a Colossal Roaming Wild covering nine symbol positions in a 3x3 grid. While you may think all the fun is over whenever your final free spin is played, you could see ants with jet packs fly across the reels to award you with an additional bonus for even more rewards. Despite their minute size, ants move at incredible speeds, as you’ll see in the background as a colony of them climb vegetation. Adam is a little lazier than the others though, preferring to travel around with a powerful jet pack strapped to his back, and he can blast onto the reels to cause one of four crazy antics on any spin in this exciting random bonus feature. Ardvark: The reels will transform to make 40 paylines active with reels randomly turned Wild. Frantic: Here the symbols on the reels will be shuffled into a series of winning combinations by the ants to bring you even more cash. Colossal: You’ll see a colony of ants marching on screen to add several Colossal Wilds to the reels which significantly boost your chances of winning. Wild: Symbols on the reels will be chosen at random to be transformed into Wilds. Ants may be incredibly small but that doesn’t mean that the wins on the reels must be, and they certainly aren’t in Wild Antics. With stunning natural surroundings, several quirky characters and a plethora of bonus features to enjoy - it’s time to join the ant colony for some fun and big wins!